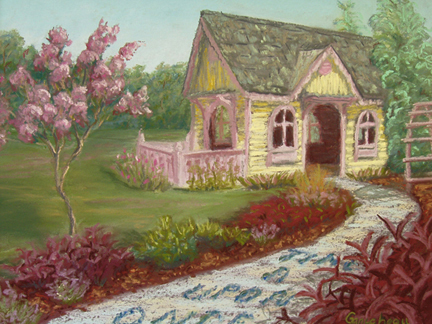 Pastel pleine-aire painting of The childrens' garden playhouse at the New Hanover County Arboretum in Wilmington, NC by Rose Ganucheau. The sky started out clear the day we painted this adorable child-sized garden play-house at the Arboretum. As the time flew, large clouds built up behind us and beyond the trees. We eventually had to take refuge in the little house and managed to escape for a moment back to time when we used to "play house".